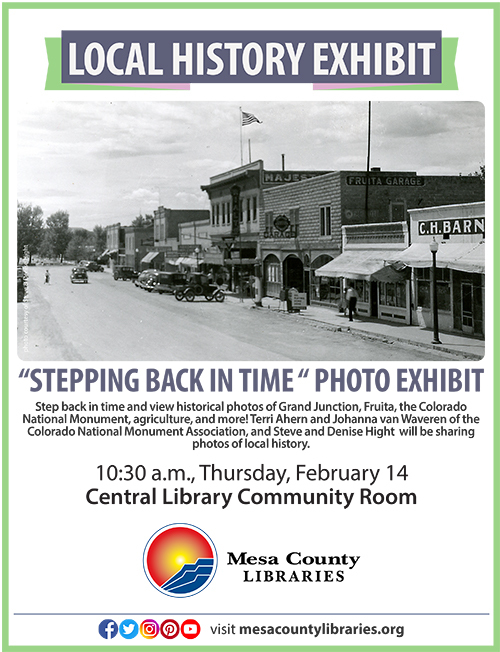 Take a historical look at the Grand Valley when local history enthusiasts present “Stepping Back in Time,” a display of photos from days gone by, from 10:30 to 11:30 a.m. Thursday, Feb. 14, at the Mesa County Libraries Central Library, 443 N. 6th St. in Grand Junction. Steve and Denise Hight will show historical photos of Grand Junction, Fruita, Colorado National Monument, agriculture, and more. The Hights have an impressive collection of old postcards that will transport viewers to another era. Terri Ahern and Johanna van Waveren of the Colorado National Monument Association will host a “Then & Now” photo exhibit of Colorado National Monument in which pictures from the 1930s, 1960s, and today are compared. Stop by and browse the past at “Stepping Back in Time.” The event is open to the public at no charge. Posted in General, Library News, Local History, Programs/Classes.